The promoters for mobile game, Clash of Clans: JJ Lin, Gao Yuan Yuan, and Jimmy Lin. Li Ying is utterly cute with her shark hat. Dancing hip-hop with William. She tried ya. She tried. JJ Lin focuses on being cute. LOL. HOLD THIS SPOT FOR MOI. 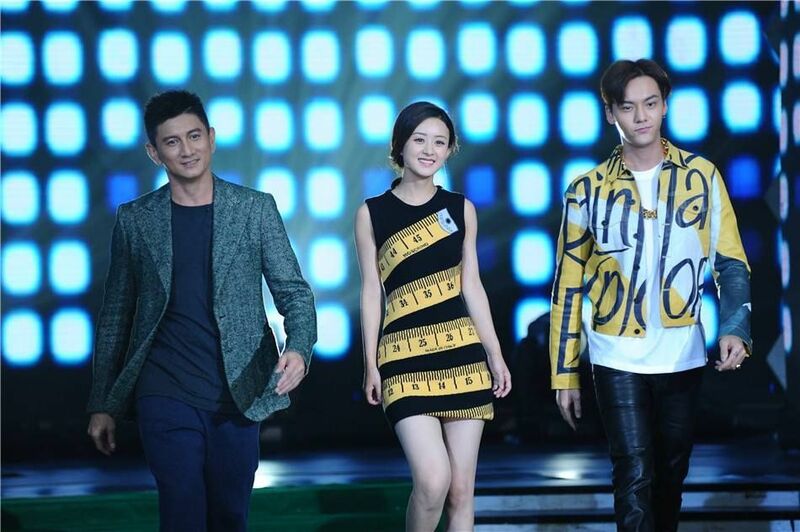 This entry was posted in Variety Shows and tagged Cvariety, Gao Yuan Yuan, Happy Camp, Jimmy Lin, JJ Lin, Nicky Wu, The Legend of Zu, William Chan, Zanilia Zhao Li Ying by Kappy. Bookmark the permalink. idk. I loved the people, but I actually didn’t find this episode very funny. I guess they were so focused on the games, the ep kind of lacked Happy Camp’s classic witty responses and dialogue. Plus, all the guests were super cute and I love them all, but except maybe Nicky, they’re not really naturally charismatic and funny. Idk, Hu Ge’s recent episode (the detective one) was similarly game-based, but there’s something about Hu Ge that makes me feel like, he’s just so witty (i need to find a different word) that he adds to Happy Camp’s characteristic of witty (again, need a new word..but this just fits so well) dialogue. Whereas, tbh, I thought this ep was entertaining enough because of the people, it just really wasn’t very funny at all to me. Li Ying being picked on by her papa and William. hehe. William plopping a balloon of water on her head. haha. So miserable. I agree about Hu Ge! I’m not his fan but caught one of his appearances (the one where the hosts kept picking on him because it was his birthday but he didn’t know) on Happy Camp and gosh, he was so smart and charming! The way he handled the situations with such ease showed that he was born for variety shows. My fav part was Gao Yuan Yuan playing shark at the end…and the behind-the-scenes part they showed at the very end. On the Li Ying + William ship now! So adorable together. Yayyy!! Thanks Kap! Have been waiting for this for weeks! I wanna know what Jimmy Lin is eating. He looks to be the same age as William! And he’s very smart! The Tang Bao swimming game was fun. You can tell tho Papa Nicky was teasing her but the “care” was there. this episode is one of the best one because it had ALL THE PEOPLE that I like along with how funny they are with each other. They are so good looking and extremely cute. 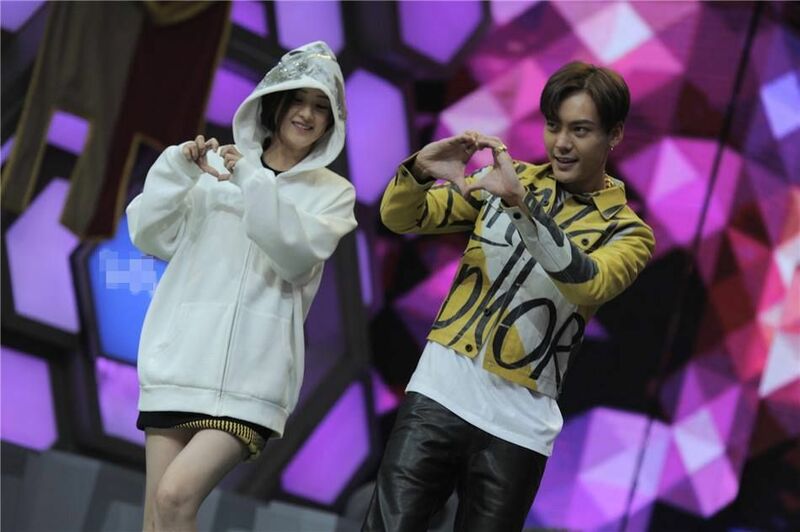 I ship Zhao LiYing and William Chan sooooo much after this. I love the part after he picked her up to stuck the beanie and then she grabbed his hand and run out of there. SO CUTE!!! 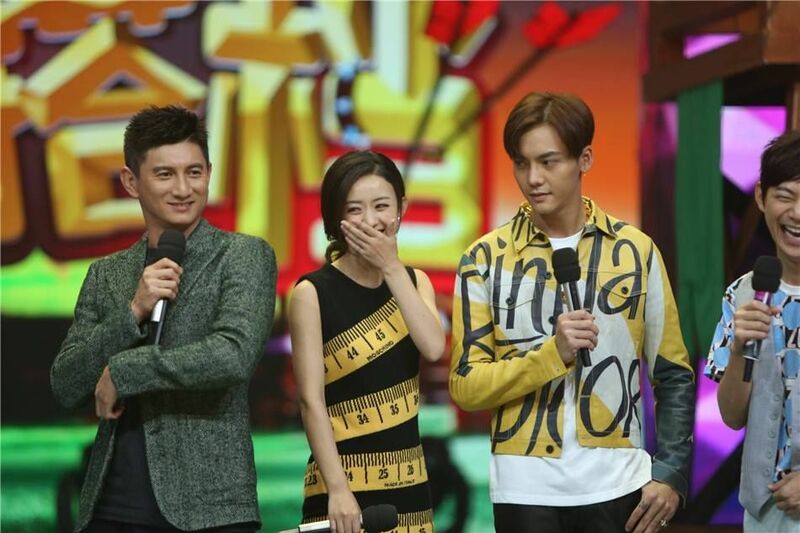 Nicky Wu was cute and funny as always when he’s on the show. He look the same and haven’t age much. Liu Shi Shi much take a good care of him there. Their Happy Camp episode is funnier (for me) and I like that Wallace takes good care of Li Ying during the whole episode. Will watch Shu Shan for Li Ying though ??? I love all the guests too. Nicky Wu and Jimmy Lin together is rarely happend this day.? This episode of Happy Camp was a snooze fest. The writers must have ran out of ideas because most of the games on the show were copied from Running Man minus the funny factor. I only managed to watch the first game before calling it quits. I don’t know what it is but this didn’t pull me in like their other episodes, despite having such a wonderful guest list. And the beginning where the hosts kept saying misleading things about ZLY and William was really weird. I know they do that sometimes to help with the drama promotions and all, but this was just weird. Can’t put it any other way. Guess I’ll have to find another day for this episode. Yes this episode is one of the best in happy camp show of course beside the TJoF cast. I think there is no spark between WC and ZLY both of them just like a good friends. It’s different when she is with Wallace it’s have some spark between them. So I still ship ZLY and Wallace huo ?? Guys, this is the second time. I don’t want to sound offensive, but it’s Legend of Zu cast, and it’s William Chan. This has absolutely NOTHING to do with Hua Qian Gu (aka Journey of the Flower), and NOTHING to do with Wallace Huo. Just wanted to correct some misunderstandings. I wish they didn’t cut out so many parts! Papa Wu teases his daughter a lot but he takes care of her well too. A practice video of the dance: She accidentally pokes his face when she waves her hand backwards. hehe. hehehe…it creeps me out you calling Papa Wu with Li ying, especially when his wife is the same age as her. She does play his daughter in the series, so I don’t see anything wrong with her or us calling him Papa and her calling him daughter. I know ShiShi is the same age as her, but just put LiYing’s picture and ShiShi’s picture next to each other and they look ages apart. LiYing can literally looks like a 14 yr old when she wants to. Agree with you…she looked cute and fragile that’s why looked william try to protect her and she looked relax when interaction with william look adorable..don’t care what people say as long as both of them happy I’ll support her.. go girl..
Like every one, I loved this episode for its cast! 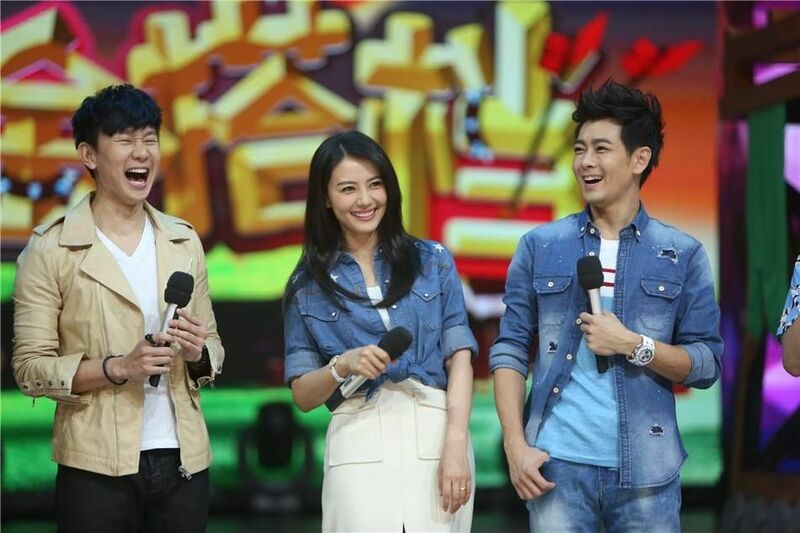 I agree the guests are not naturally funny on tv, but William kinda surprises me every time he’s on Happy Camp. I have watched all of his appearances but he always seemed so docile, it’s like the William I saw in BTS videos should be a lot more fun? Maybe he’s still not comfortable on Happy Camp? Loved the episode! Wished for more interactions between the casts though–specifically the Zu cast. Did anyone else catch the part at 31:05 when William tried to protect ZLY from getting hit by the JJ Lin and other-girl-host couple (after completing their game with the hat thingy), but ended up stroking the back of her head instead? It’s adorable how comfortable they are with one another. I ship! Agreeing with everyone else here, i only watched it for the cast and ofc my bias JJ hahaha. Sadly i dont ship LY with neither wallace nor william but i have to say (very shamely) w he lao shi! Does anyone board this ship with me?? I only ship them because of up idol, too many cute scenes i cant breathe. That’s a pity, sadly 🙁 i have heard before that he has a partner but i wasn’t really sure cause i read it from tabloid news. And also the way the up idol cast tease him with LY makes it all seem like he doesn’t have a partner so ??? With all honesty, I am just really confused hahaha, i dont really know what to think of it..
Hi guys, so glad to have found this page with lots of info about my favorite actress, ZLY, ahhh she is too adorable. I just want to squeeze her cheeks…. Lol… She’s like a doll.